Five narratives retell episodes of Queensland history to reinstate knowledges that have been buried in police and government files, as well as documents put together by explorers, stockmen and settlers. The revived narratives bring Aboriginal oral memory and the ‘unvoiced’ into the Australian public domain. It is important to Aboriginal people, and Australia as a whole, that heroes from Aboriginal society are brought to light and that information about these people is circulated so their stories become popular knowledge. 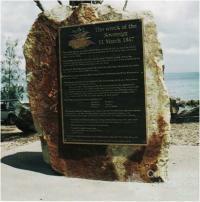 The establishment of the penal settlement at Redcliffe on Moreton Bay in 1824 brought about a dramatic disruption to the lives and cultural patterns of Aboriginal people in Queensland. Relationships to the land as well as people, law, religious practices and social activities were all affected by the invasion of Aboriginal space by the new Australians. The historic meeting of two cultures provides cultural reference points to the changes wrought upon the first Australians. 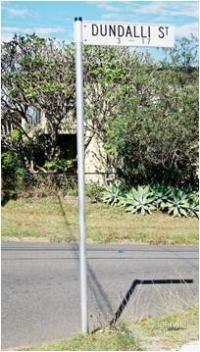 Markers to some of these stories are now in the landscape of Queensland. In 1847, seven Aboriginal people risked their lives to save those on the sinking ship the Sovereign. The Sovereign was a 119 ton wooden paddle steamer built in Balmain, Sydney in 1842 that belonged to the Hunter River Steam Navigation Company. It did return runs between Sydney and Brisbane taking on passengers and cargo. A one-way trip from Sydney to Brisbane usually took three days and cost ₤4 for a saloon berth or ₤2 for steerage. On the 3 March 1847, the Sovereign was leaving Brisbane for Sydney with a large cargo of 40 bales of wool, hides, tallow and sundries. There were 28 passengers and 26 crew on board. 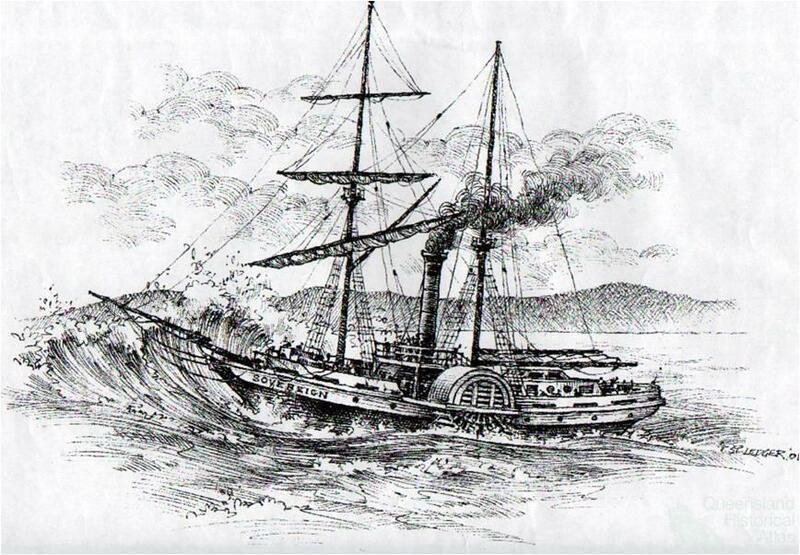 After anchoring at Amity Point, Stradbroke Island, for six days because of bad weather they attempted to navigate the passage between Moreton Island and Stradbroke Island but struck the bar and capsized on 11 March 1847. Forty-four people drowned and ten were saved by seven Aboriginal men from Stradbroke (Minjerribah) and Moreton Island (Moorgumpin). These men were Toompani, Poonipum, Woondu, Nu-Ah-Ju, Nuggun and Jackie Jackie, the seventh member unnamed. They were awarded brass breastplates and a fishing boat, The Pirate, in recognition of their deeds by Captain Wickham. 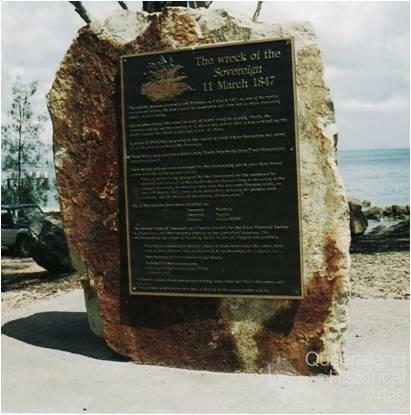 The memory of this event passed out of people’s memory for 155 years until a stone memorial was unveiled by the Queensland Minister for Aboriginal and Torres Strait Islander Policy, Judy Spence, at Amity Point Stradbroke Island in 2002. ‘Nulpar cungie cooba – We, too, will be forgotten: seven brave men’. Dundalli was a Turrwan (Yuggara word for leader), and was educated in Aboriginal law. In 1840-1850, when Brisbane Town began casting off the yoke of military and penal colony rule, the first Australians were coming to the realisation that the new Australians were here to stay. Dundalli was chosen as the Turrwan to conduct restorative justice. He retaliated for the shooting and poisoning of Aboriginal people by settlers. For over 10 years Dundalli attacked settlers, conducted robbery causing serious bodily harm and killed stock. Aboriginal people saw him as a resistance leader, but the new Australians saw him as a criminal and murderer. Dundalli was charged in 1854 and committed to trial for the robbery with violence at German missionary Rev J.G Haussmann’s station in 1845; for the murder of station owner Andrew Gregor and his servant Mary Shannon in 1846; for the murder of sawyers Boller and Waller in 1847; for the murder of fisherman Charles Gray near Bribie Island; and for the murder of shepherd Michael Halloran. He was found guilty of two counts of murder and one of robbery with violence and hanged in 1855, the last official public execution in Queensland. As time passes, the memory of Dundalli has passed out of our conscious memory, but he (along with his actions) has remained in Aboriginal cultural memory. 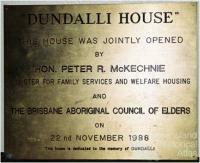 Dundalli is remembered in Brisbane spaces including street signs such as in West Chermside, buildings with his name, as well as government service providers, the Dundalli Youth Services and a plaque dedicated to his memory at the Post Office in the GPO of Brisbane. Dundalli has left a footprint in both the memory of Aboriginal and non-Aboriginal people. In 1879, six black trackers (native police), two from Fraser Island, were hired to track the Kelly gang. They arrived in Benalla, in northeast Victoria, on 10 March 1879. Owing to the failure of the Victorian police force to track the Kelly gang, an invitation was sent via electric telegraph on 15 February 1879 to D.Y. Seymour, Commissioner of Police in Queensland, requesting that Queensland Native Mounted Police be sent south to Victoria. The Victorian police did not believe at the time that any of the Victorian Aboriginal trackers were ‘competent and trustworthy’. They believed the use of trackers would ‘bring the matter to a head’ if ‘they had good trackers’. The Victorian colonial government paid the Queensland Native Mounted Police ‘£3 a month’ and each was meant to receive £50 of the £8000 reward money posted at the time. Despite the role of the Queensland Aboriginal trackers in the capture of the Kelly Gang, they did not receive any share of the reward monies and the reward money is still unpaid. In 1881 an Aboriginal man Charlie Flannigan, was included in a cattle drive of 20,000 head of cattle from Richmond Downs in Queensland to the Northern Territory. He drove cattle along an Aboriginal road which later became the stock route to the Northern Territory between Burketown and Borroloola and is known as the Hells Gate track. He won the 1887 Palmerston Cup on the horse Cygnet. Five years later, on the 20 September 1892, Flannigan was charged with the murder of Samuel Croker (Greenhide Sam) over a card game, he was incarcerated in Fannie Bay Gaol in Darwin until he was hanged on 15 July 1893. 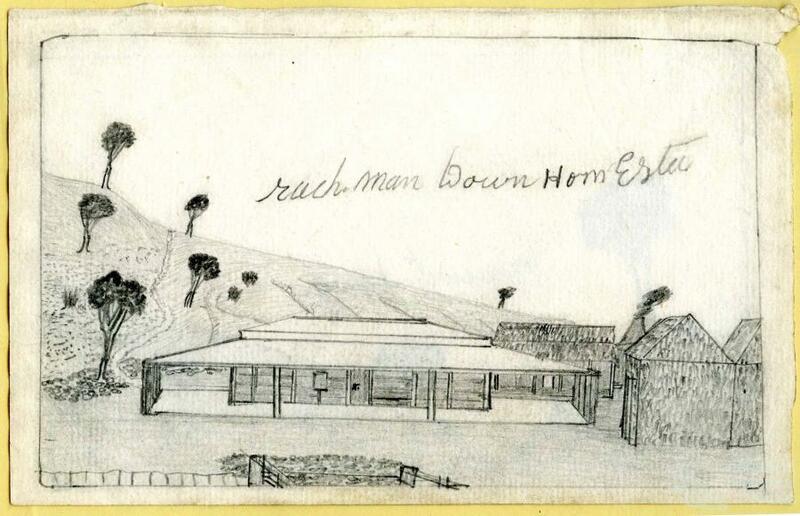 While awaiting trial in Fannie Bay Gaol, he drew and sketched from memory his experiences as a drover. These visual works provide a valuable window to life as a stockman from the late 1800s. Flannigan was the first man to be hanged at Fannie Bay Gaol. His hanging created a public furore about capital punishment. Flannigan, spent most of his young life in the company of wild horsemen, cattle and horses on the northern frontier of the colony. He was born in 1865 at Richmond Downs near the township of Richmond in north Queensland. He worked on cattle stations at the Ord River Station, Wave Hill Station, Victoria River Downs and many more that were dotted across the Top End doing odd jobs as a general roustabout. He was recognised for his skills as a horseman and was employed as a strapper, stable hand and jockey. As a jockey he participated in both the official and the unofficial race meets at Playford, Pine Creek, Yam Creek, Brocks Creek, Borroloola, Wyndham and Halls Creek across the colonies of Northern Territory, Western Australia and Queensland. In 1899-1902 a major war, the Anglo-Boer War, was being fought with troops from the Australian colonies in South Africa. 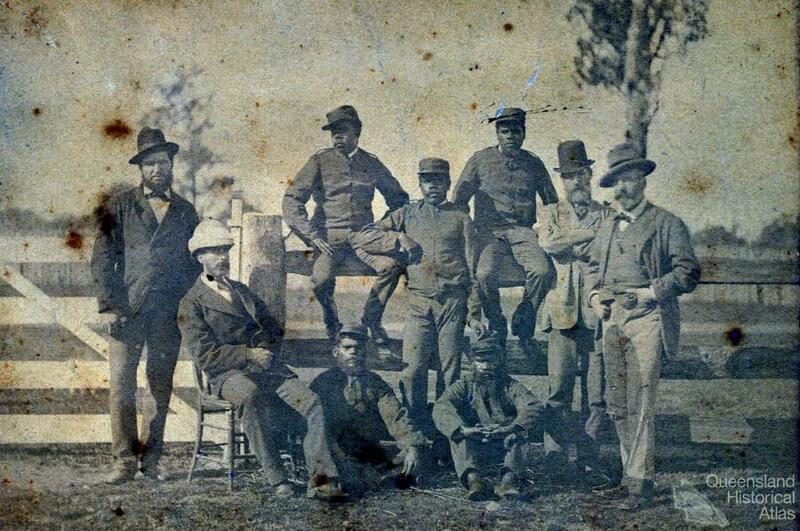 Aboriginal men participated in this conflict with four Queensland Aboriginal men sent to serve in the Boer War. However, little else is known about these men, their units or if they came home to Queensland. It is known that in 1902 a request from Lord Kitchener, commander-in-chief of the Imperial British Army in South Africa, was sent to the Australian Prime Minister, Edmund Barton. Kitchener insisted that Aboriginal trackers be sent to South Africa to provide scouting and tracking. A story that has been told and retold tells of one of these men and his tracking abilities. In this story a group of English officers were deriding the tracking abilities of Aboriginal Australians. A wager was negotiated and the Australian soldiers took the bet. The tracker Billy was asked to track five British Officers who started, at different hours and went in various directions, two on foot, and three on horseback. Billy tracked the officers over the hard and rocky ground of the veldt, he was given a day to track these officers. 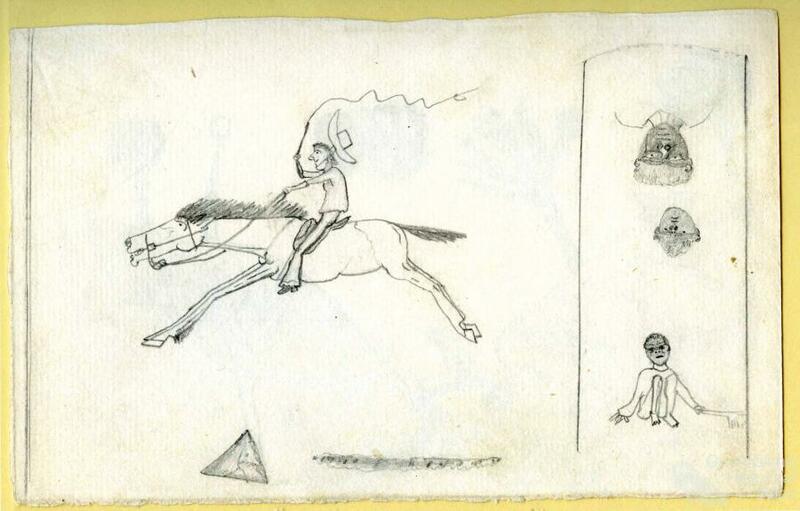 On reporting back he drew five lines: those of the mounted men he followed at a run. He described how one had got off his horse and had then proceeded to light his pipe, producing the half burnt match to prove it. 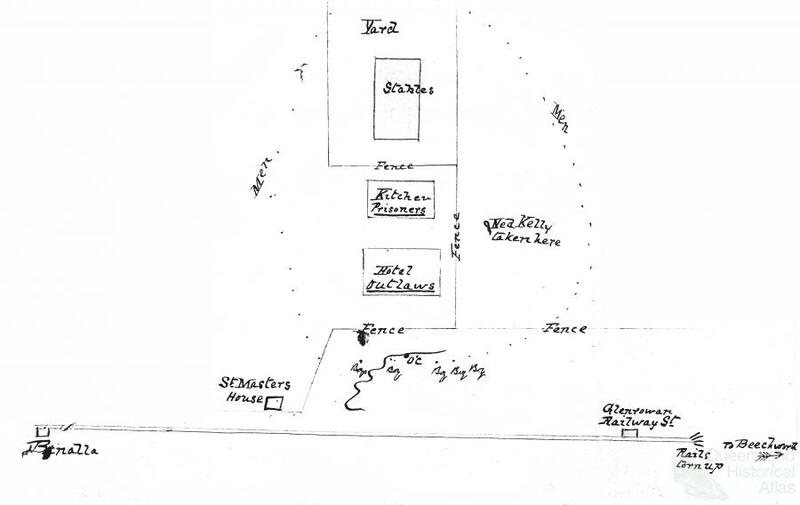 He described the activities of each of the officers and where they rested, he also produced material evidence such as the match to prove he tracked the five officers. The Australian soldiers won the bet and confirmed the legendary tracking abilities of the Aboriginal tracker.